Education: Electrical engineering, Tsinghua University. Career: Retired from 17th Politburo Standing Committee in November 2012. Prospects: Retired as Chair of National People’s Congress in March 2013. Chairman of the Standing Committee of the National People’s Congress 2003 – 2013; this position made him China’s chief legislator during this period. 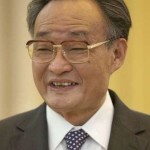 Was in the Politburo from 1992 – 2012, and a member of the Standing Committee 2002 – 2012. He was Vice Premier under Li Peng and then Zhu Rongji and his rise to power came via Shanghai where he was Party Secretary in the 1990s, and became an ally of Jiang Zemin. Major focus has been economic development. He has supervised massive layoffs, etc. in a big push to clean up state-owned industries…. “had to walk a political tightrope, laying off millions to turn backward state firms into commercially viable concerns, but remained unflappable.” (Reuters) He also supervised the Three Gorges Dam project. May 2009: Wu told Nancy Pelosi in Beijing that Taiwan and Tibet were the two most sensitive issues in US-China relations. March 2010, Financial Times: He is considered a princeling, but it is unclear whether he is one who has risen on his own merits or one who makes unfair use of his family connections, the latter group being one of the major causes of discontent in China. Amnesty and Human Rights Watch (HRW) considered him influential enough to address open letters to him, HRW on behalf of Liu Xiaobo. He did much foreign travel. His son-in-law, Wilson Feng, is in China’s new private equity industry. Worked for Merrill Lynch and assisted in Merrill’s taking the Industrial and Commercial Bank of China public in Hong Kong, at the time apparently the largest initial public offering in history.